I just updated my version of GC. In the upper right corner there is a little arrow inside of brackets labeled as 'select viewport type'. But there was another button to the left of it in the older version I just upgraded from labeled 'Full Screen mode' When I hit that button it got rid of most of the interface which I like. That button is gone in the latest release. It was tied to the ALT + ENTER hotkey. But when I hit that hotkey now, it behaves differently. It puts GC in borderless mode. I actually like that, but I would also like it to get rid of the interface the way the old version did. Is there a way to accomplish that now? I already found a hotkey for the side panel, so I turned that off. But I can't find any way to turn off the rest of the interface. I am referring to the region tab, the left panel, and the panel underneath the menu bar. EDIT: It just occurred to me that I may have remapped that 'full screen mode' button to ALT + ENTER myself at some point in the past. I am not sure now. But if you can help me get rid of the panels, that would be great. 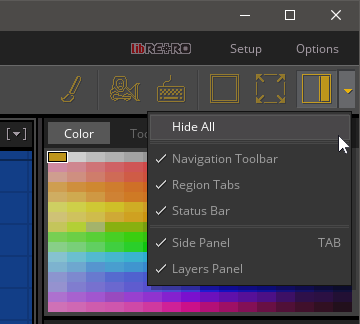 You can turn off many of the interface elements by going to Options > Interface and unchecking the boxes in the 'Interface Elements' section. There's currently no way to hide the ribbon bar and main toolbar across the top of the application, so I appreciate this isn't as much space as you used to have. I'll have a think about ways to improve this further. Thank you. Just adding more checkmark options in the interface elements section to turn off more of the interface would be just fine with me. Or even better I think, a hotkey or button that can just remove the entire interface, so I can bring it back quickly when I need it. Okay, no problem - that's tucked-away in the next version. You'll be able to assign a key shortcut in: Options > Input > Key Mapping > Misc > "Toggle All Interface"
In future I'd like to make this a bit better, but it'll hopefully do you alright for now. That will do just fine. Thank you! I spent a bit of extra time on this and moved the Options > Interface checkboxes out into this little drop-down. As you can see, included on there is the hide all options (which changes to show all if everything is turned off). Looks good to me. Thanks for the pic. It really helps me to understand what you did.